• Destroying patriarchy and building a genuine democracy at all levels of society. 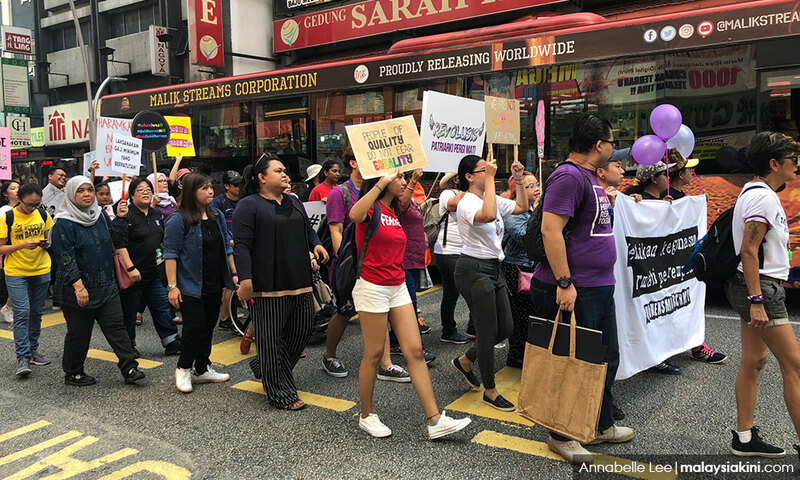 More than 300 people had gathered in downtown Kuala Lumpur for the Women's March yesterday, including members of the LGBT community and those in solidarity. 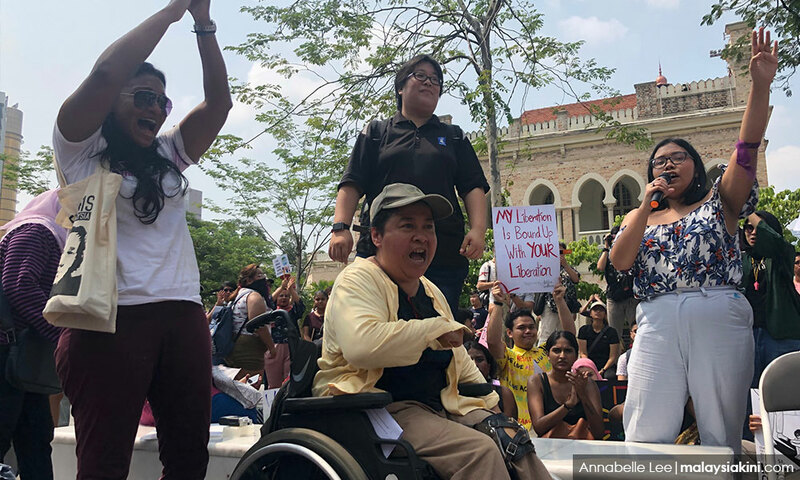 While there were shouts of "Jangan kacau LGBT (Leave the LGBT community alone)" and "Hidup LGBT (Long live LGBT)" during the demonstration, the speeches had focused on the five key demands. 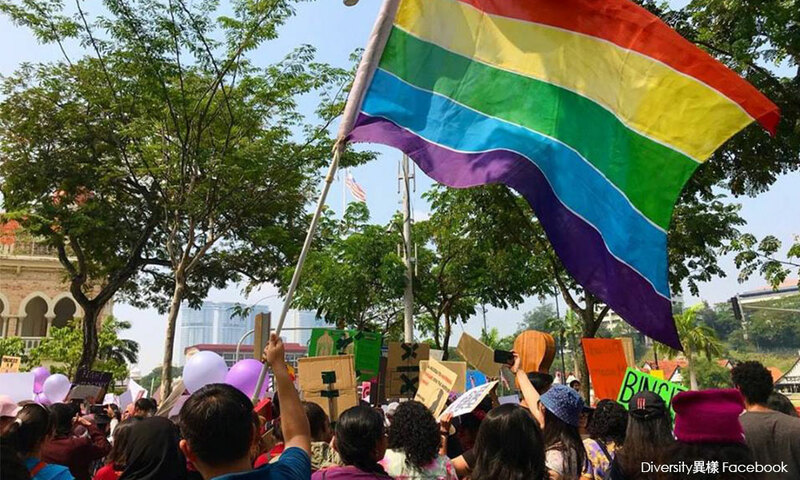 The presence of the LGBT community at the Women's March has been criticised by several politicians, including de facto Islamic Affairs Minister Mujahid Yusof Rawa and Wanita Umno chief Noraini Ahmad. In a statement today, the organisers said there was a rich diversity of voices at the march that represented concerns of women from all sections of society, who spoke clearly and loudly about their realities and vision for a better nation. 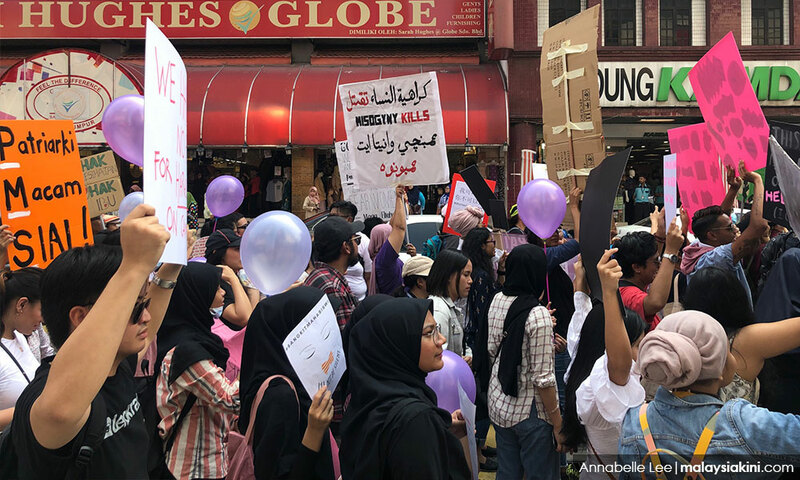 “This included women from Sarawak who demanded equal access to maternal healthcare, and shared the tragic story of Kam Agong who lost her life due to medical negligence after delivering her eighth child. Harapan OKU member Naziaty Mohd Yaacob spoke of the challenges faced by women and girls with disabilities, including in gaining recognition and access to justice for gender-based violence. “Representatives from Orang Asli women demanded equal access and control over their land and resources, while representatives of young women demanded the right to comprehensive education on gender equality and sexual rights to address the root causes of gender-based violence. 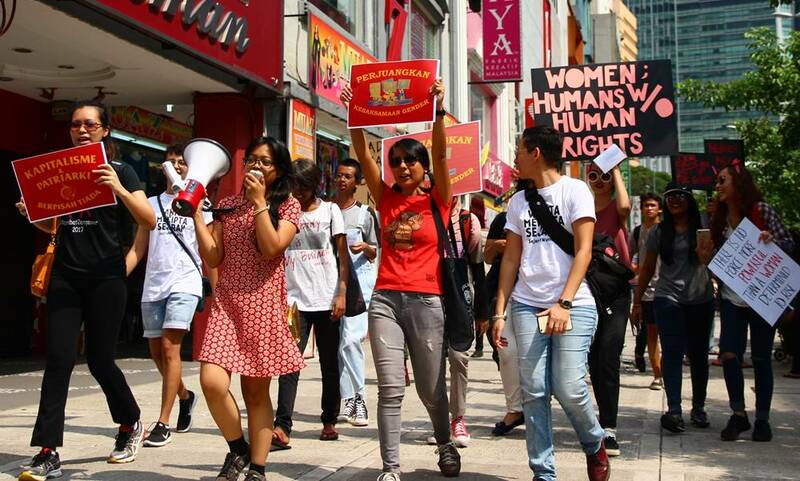 “There was also an overwhelming collective demand for increasing the minimum wage to RM1,800, in recognition of the fact that most low-income earners are women,” the statement read. Organisers said the importance of these realities and demands were entirely sidelined by the media and attackers of the march, with disproportionate attention being paid to singling out the presence of LGBT participants. “This borders on incitement to hatred and violence towards a section of Malaysian society who are already at risk and facing multiple forms of discrimination. The organisers reminded the government that it is their duty to defend this basic principle, particularly those who are marginalised in society. It said the government cannot be selective in carrying out this duty to only particular groups of women, but must apply this to all regardless of ethnicity, age, ability, location, gender or sexuality. “This includes not only lesbian, bisexual, intersex, queer and transwomen, but also indigenous women, young women, women domestic workers, women with disabilities, rural women, single women, heterosexual women and more. “The specific and deliberate non-recognition of LGBT women acts as an attempt to exclude and erase an entire segment of the population of women. Without such an intersectional and inclusive approach, all of our measures towards building a more peaceful, harmonious and developed nation will be hampered,” organisers said. “We call for reason, restraint, openness and respect by all parties who are currently launching a campaign of hate and aggression towards the march. Meanwhile, in a separate statement, Bersih also reminded Mujahid that democracy is about allowing all quarters to express their views and concerns in a peaceful way, including gathering peacefully. It cited Article 10 of the Federal Constitution, which stated every citizen has a right to freedom of speech, expression, peaceful assembly and form associations. “One need not agree with all the views expressed or issues championed but one should seek to listen and understand even if, after doing so, one disagrees. It added that since May 9, Malaysia has witnessed the anti-Icerd, 'Melayu bangkit', 'defend Prophet Muhammad' and other gatherings, and Bersih commended the Pakatan Harapan government for allowing and facilitating such gatherings without intimidation. However, Bersih said they are concerned that with the posture taken by Mujahid and various politicians and groups, it would encourage further hate and discrimination against the LGBT community. Bersih is also appalled that Mujahid said that the Women's March rally did not have a permit because the notice to hold the rally was submitted less than 10 days before it was held and that the organisers will be investigated under Section 9 of the Peaceful Assembly Act 2012.